Comments: ALTERNATE EDITION: Brand New,Paperback , International Edition , Same text as US edition ,Different ISBN /Cover , printed in english , Ready to ship, fast delivery (5-8 busienss days ) worldwide. 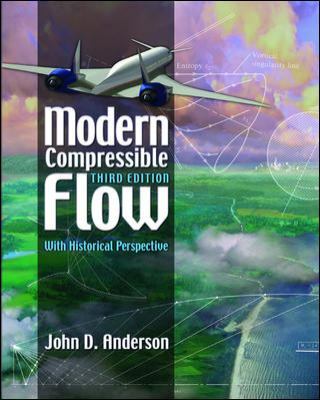 Anderson's book provides the most accessible approach to compressible flow for Mechanical and Aerospace Engineering students and professionals. In keeping with previous versions, the 3rd edition uses numerous historical vignettes that show the evolution of the field. New pedagogical features--"Roadmaps" showing the development of a given topic, and "Design Boxes" giving examples of design decisions--will make the 3rd edition even more practical and user-friendly than before. The 3rd edition strikes a careful balance between classical methods of determining compressible flow, and modern numerical and computer techniques (such as CFD) now used widely in industry & research. A new Book Website will contain all problem solutions for instructors.Anderson, John David is the author of 'Modern Compressible Flow With Historical Perspective', published 2002 under ISBN 9780072424430 and ISBN 0072424435. Loading marketplace prices 166 copies from $19.90 How does the rental process work?